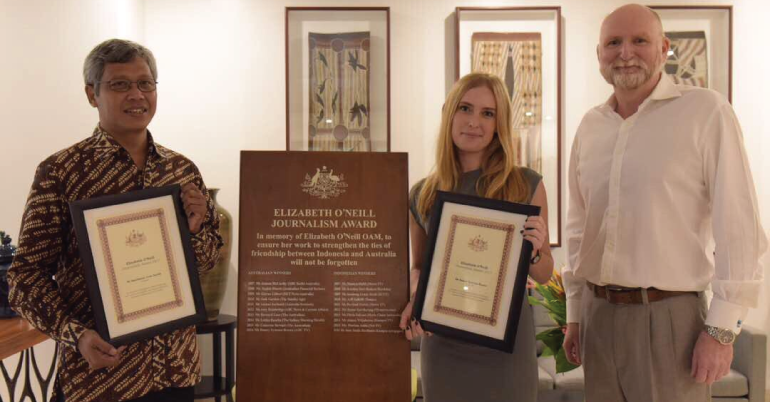 The Australian Department of Foreign Affairs and Trade and the Australia-Indonesia Institute invite applications for the Elizabeth O’Neill Journalism Award. The Elizabeth O’Neill Journalism Award commemorates the distinguished career of Elizabeth O’Neill OAM who died in service of the Department of Foreign Affairs and Trade in Indonesia on 7 March 2007. The Award builds on her tireless work to foster mutual understanding of Australia and Indonesia through accurate and informed media coverage. The Elizabeth O’Neill Journalism Award is awarded to one journalist from Indonesia and one journalist from Australia each year. The Award is open to high-achieving journalists from print, radio, television and online media organisations at any stage of their career. Programs are tailored to the journalist’s area of expertise and reporting responsibilities in such areas as foreign and trade policy, development assistance, people-to-people links and education and include a stay in the country’s capital city (Jakarta/Canberra) with visits to at least one other province/state/territory of the country visited. Must be Australian citizens resident in Australia or Indonesian citizens resident in Indonesia. Two Awards are made: one to an Indonesia journalist and one to an Australian journalist. To apply, visit the given link.